Two years ago, renowned activist and singer/songwriter Michael Franti travelled with his guitar and video cameras to the war zones of Iraq, Israel and the Occupied Palestinian Territories. Franti is now ready to release the fruits of that journey in the form of a documentary titled I Know I'm Not Alone and a new Spearhead album called Yell Fire! Ironically, Franti's experience viewing the human cost of war gave birth to what he describes as his most uplifting album to date. "The thing that I found when I was in war zones was that nobody wants to hear songs about war," he says. "They want to hear songs about connection to people, and songs about love and life, songs that make them dance." Following a suggestion from friend and Island Records founder Chris Blackwell, Franti chose Kingston, Jamaica as the backdrop for the recording of Yell Fire! He was joined there by legendary rhythm artists Sly And Robbie on live drums and bass, percussionist Sticky Thompson, and Spearhead members Carl Young on bass and Dave Shul on guitar. Yell Fire! 's tracks were recorded at Anchor Studios with engineers Mario Caldato Jr. and Robert Carranza (Beastie Boys, Jack Johnson). 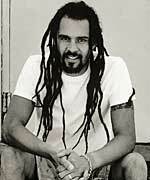 After the Kingston sessions, Franti continued to write and record upon returning home to San Francisco. There, mixing duties were handed over to Brian Malouf (Eric B, Ziggy Marley, Pearl Jam). Franti's music has always been injected with political undertones and meditations on social justice, from his beginnings with punk band Beatnigs to his stint with industrial-noise artists Disposable Heroes Of Hiphoprisy and on through Spearhead. Though Franti and friends' sound has changed and evolved over time, he feels that he achieved a cohesiveness with Yell Fire! that wasn't there before. "In the past we've touched on a lot of genres of music, but this is an album where all those things have been rolled into one. I feel this is our best record yet." "One Step Closer To You" features backing vocals by Pink and "Is Love Enough?" has a guest turn from reggae artist, Gentleman. Yell Fire!, in Franti's mind, has become inextricably linked with I Know I'm Not Alone. After returning to San Francisco to finish the album, Franti also began to edit hundreds of hours of footage from his Middle East travels. "My editing studio for the movie was upstairs and my recording studio was downstairs, so I would constantly alternate from one project to another," he explains. "The process was like a catharsis for me, moving through this journey I had made." Yell Fire! will be released on July 25 by Epitaph's Anti label and I Know I'm Not Alone will come out this summer. "I Know I'm Not Alone"
"One Step Closer To You"
"See You In The Light"